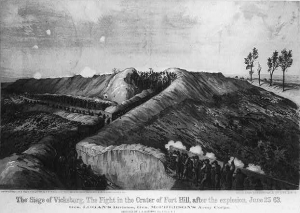 Frequently asked questions about Siege of Vicksburg. By late 1861, President Abraham Lincoln was pressuring Union commanders in the west to invade the South. On January 30, 1862, the Western Theater commander, General Henry Halleck, reluctantly approved Brigadier General Ulysses S. Grant's request to attack Fort Henry, located on the Tennessee River. Lieutenant General John C. Pemberton surrendered the city and more than 29,000 soldiers of the Army of Mississippi to Grant on July 4, 1863.